In a large bowl, cream butter and sugars until light and fluffy. Beat in egg, if using or add egg replacer. Combine the flour, baking powder, baking soda and salt; add to creamed mixture and alternate with sour cream, beating well after each addition. Fold in rhubarb. Fill paper-lined or greased muffin cups three-fourths full. Combine brown sugar, maple syrup, and cinnamon in a small bowl; then cut in butter until crumbly. Sprinkle over batter. Bake at 350° for 18-20 minutes or until a toothpick inserted near the center comes out clean. Serve warm. Yield: about 1-1/2 dozen. 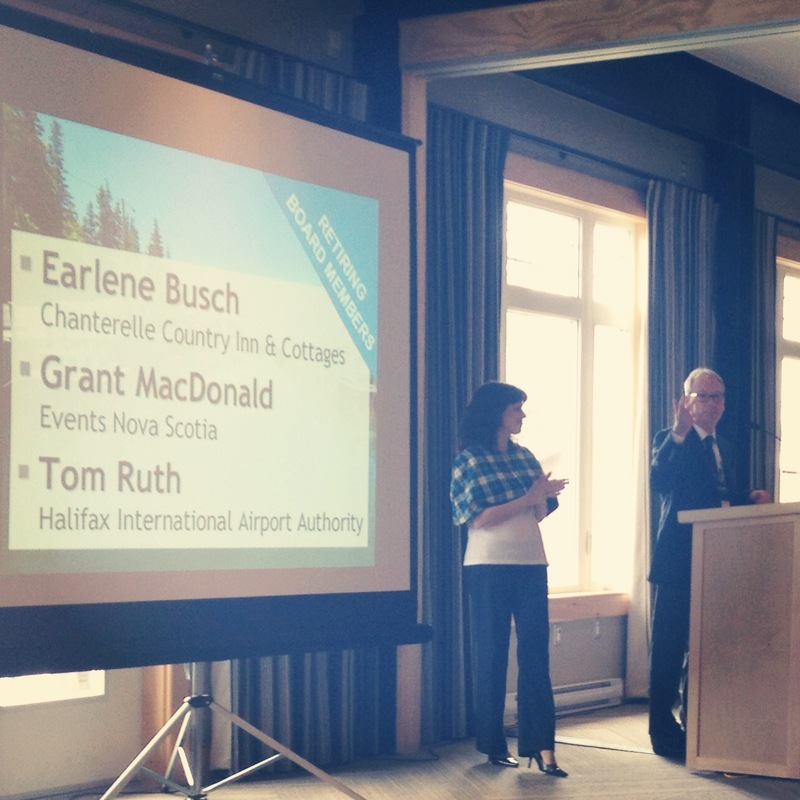 At the end of last week, I represented the Nova Scotia Bed & Breakfast Association (NSBBA) at the Tourism Industry Association of Nova Scotia (TIANS) annual general meeting (AGM). Each year the AGM is held at different locations around the province, and last year it was held in Truro. In fact, five of the B&B’s in Truro – including Belgravia – made breakfast for the 120 participants. 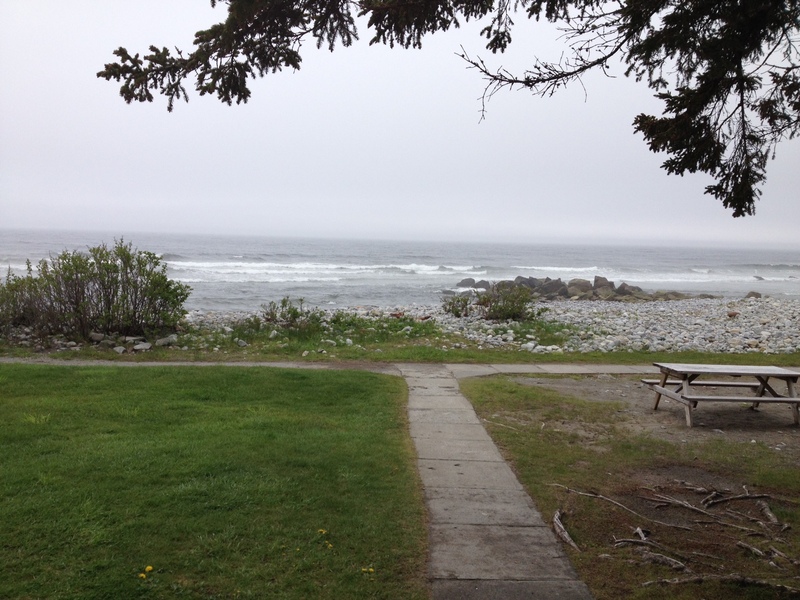 🙂 This year, the AGM was held at White Point Beach Resort in Liverpool, Nova Scotia. In November of 2011, the main lodge at White Point was destroyed by fire. The owners decided to rebuild, using as many local trades, crafts people, and supplies as possible. They consulted with their long-time guests regarding design, and let the world watch the rebuild through Nova Scotia webcams. The result is spectacular! They did an excellent job of maintaining the “feel” of the old lodge, yet were able to improve on many things. And with a setting like this, how can you go wrong? View from the front porch of the cabin. We met for two days of meetings and socialization, trying to determine as an industry how we can improve our product for our guests. We are working on issues such as lobbying the government for an “open skies” agreement which would make airline access more plentiful, easier to access, and most importantly – more affordable! Another important issue we’re working on is to have a ferry link between New England and Nova Scotia restored – the sooner the better! We also are continuously working towards improved signage and roads. What makes meetings like the TIANS AGM critical, is that we have all sectors of the tourism industry from B&B’s to large hotels to festival and event coordinators to tour operators to restaurant owners to winery owners, to the Regional Tourism Industry Associations, all working together with government. The new Minister of the Nova Scotia Department of Economic and Rural Development and Tourism, Graham Steele, was present and was listening. Pat Sullivan, CEO of the Nova Scotia Tourism Agency was doing the same. There is a real feeling of camaraderie as we all work together. It wasn’t all work though – we shared some wonderful meals together courtesy of White Point. After dinner, we roasted s’mores (Graham crackers, marshmallows and chocolate melted together) over the fire in the main lodge. Since the rain held off, there was also a bonfire outside on the beach after dark. As part of the business meeting, we said welcome to three new board members: Sheri MacKillop, Dean of the School of Business at NSCC, Carl Sparkes, owner of Jost and Gaspereau Wineries, and Andrew Alkenback, general Manager of Cabot Links Resort. Unfortunately, this also meant we had to say goodbye to board members who are finished their terms. Last year, when our terms were finished, Danny Morton of White Point and I were made “Tourism Senators” (that title seemed much more illustrious at this time last year!) and were each given an article of clothing made from Dress Nova Scotia tartan. This year, Danny & I were able to do the same for our three retiring board members: Earlene Busch, Chanterelle Country Inn, Grant MacDonald, Events Nova Scotia, and Tom Ruth, Halifax International Airport Authority. Wearing our “Tourism Senate” attire. It’s always refreshing and enriching to get together with members of the Nova Scotia tourism industry as a whole, and I was especially excited to get to experience the new and improved White Point. 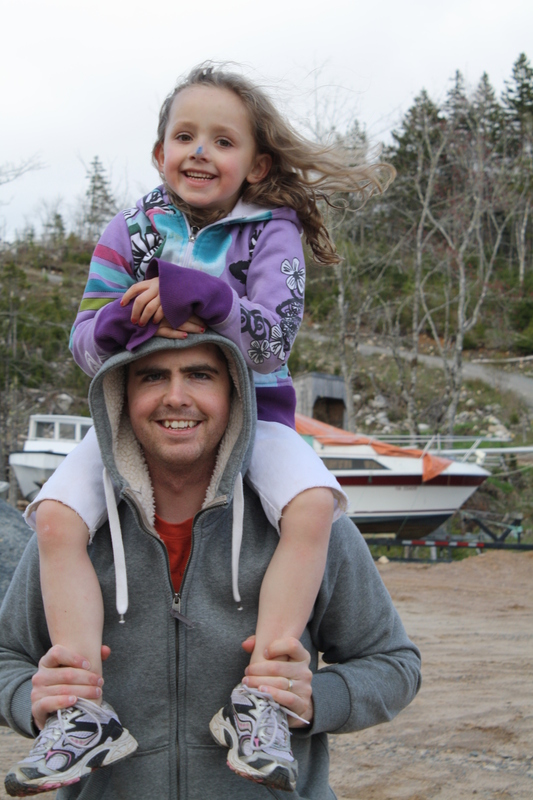 I am looking forward to going back with the family soon on our own Nova Scotia travel adventure! We would like to thank you from the bottom of our hearts for taking the time to vote for us in the Best of Colchester Awards. We received notice yesterday that we made it to the top two in the “Best Bed & Breakfast” category with our friends from Eagle’s Landing B&B. the winner will be announced on June 13th at the Truro and Colchester Chamber Best if Colchester Awards. Again… Thank you! We couldn’t have done it without your help! If there’s one thing we’ve learned over the years, it’s that “life happens”. Depending on the situation, it can make things really complicated when you have a house full of paying guests. The charm of choosing a bed & breakfast means that you are staying in our home. All B&B’s in Nova Scotia by regulation are owner occupied. 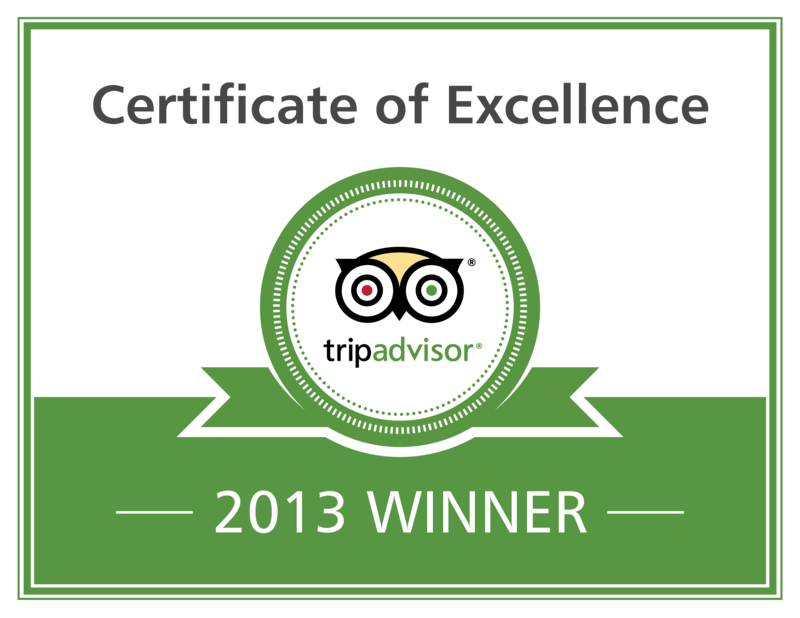 When we say you will receive an authentic experience, we mean it! In the ten years we’ve had our bed & breakfast, luckily there have only been a handful (or two) of times when things have gone “wrong”. Rooms after Hurricane Juan when we had no power for five days? Our German guests proclaimed that they “take cold showers anyway”. Breakfast on the barbeque and evenings by candlelight were a novelty – and dare I say, fun?! Six months of strict bedrest while pregnant? The rest of the family stepped in. A phone call that a motorcycle accident claimed the life of a cousin as we had breakfast plates in hand, ready to serve? We put on our “stage faces” and grieved when our guests had departed. Scarlet fever in the house? We called our guests and found alternate arrangements before they arrived. Anaphylaxis while a party is happening? One of us stays to “host” while the other sneaks out the back door to the hospital. One of our favourite (maybe not the proper choice of words?!) stories is the time I had an allergic reaction to an antibiotic when we had a full house. I lost all feeling in my arms and legs. D’Arcy called 911 and the paramedics carried me through the hallway and downstairs to the ambulance in the middle of the night while I shushed them the entire time. One of them asked, “What’s the problem? Is this a boarding house or something?” Our guests had no idea! Last night, we had a new experience. Our youngest daughter was sick. She was running a fever and her breathing was labored. It didn’t take long to realize she had moved from “bug” to “sick”; she was really struggling to breathe. Our previously booked guests (from Australia) were already checked-in and were on their way to go Tidal Bore Rafting. I told D’Arcy that I thought we needed to get her checked, so he drove us to the hospital (holiday Monday), leaving our boys in charge. It turned out that Olivia was admitted to hospital immediately with bacterial pneumonia and the rest of us went into overdrive, making and changing plans. My dad came to our house to chat with guests while D’Arcy looked after supper, bedtimes, and getting ready for a substitute at school today. The plan was made that I was going to take the night shift at the hospital and he was going to relieve me in the morning. Our guests may have found it odd that a 14-year-old let them in, but I don’t think they realized the busyness or stress behind the scenes until D’Arcy admitted to them this morning that he was on his way to the hospital to be with his daughter. Olivia is home now. Although not perky yet, the IV antibiotics helped. She’s a real trooper and didn’t cry or complain at all while we were there. (Other than telling me she wanted to go home.) That being said, our own beds feel really good tonight! 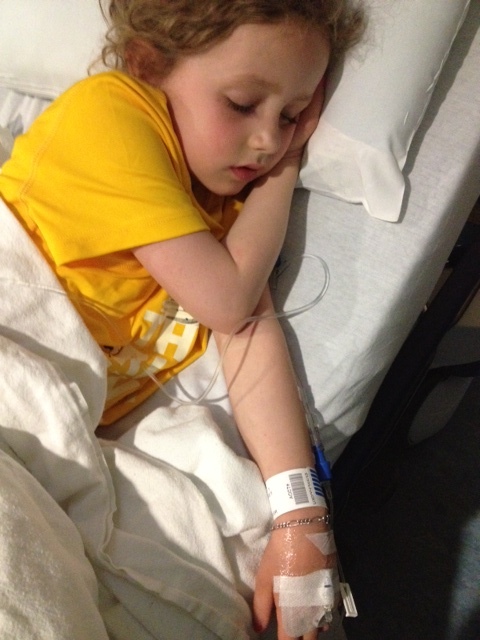 Olivia in the Truro hospital, on IV antibiotics for bacterial pneumonia. 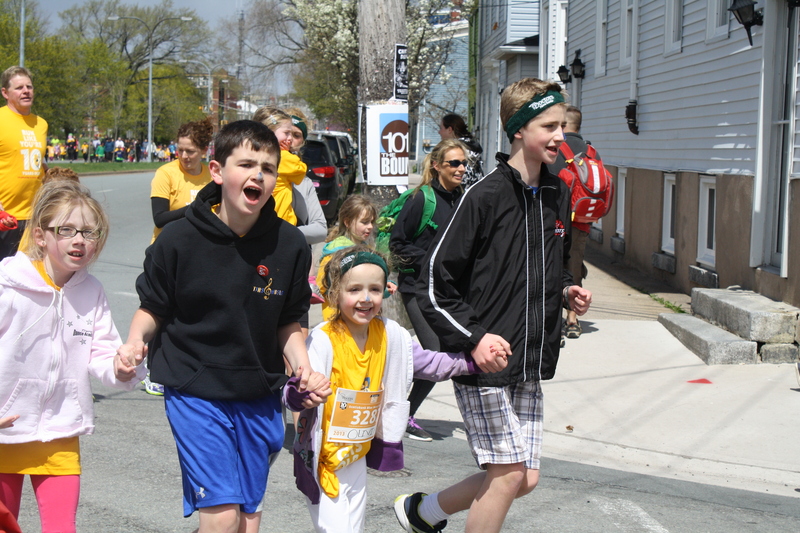 She’s worn her Bluenose Marathon Youth Run shirt each day from Saturday to Tuesday! 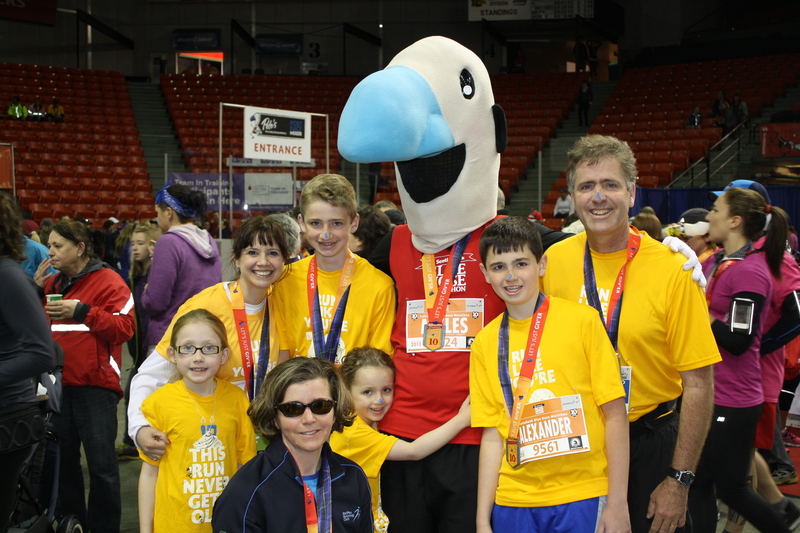 We Gave’r at the 2013 Bluenose Marathon! Let me begin by making it clear that I (Anne) am a fair-weather runner in every sense of the word! 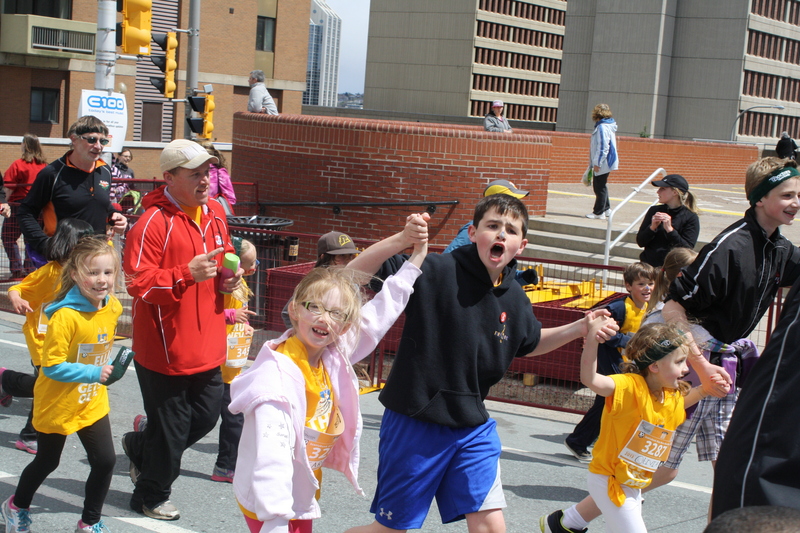 However, one of our favourite family traditions takes place on the long weekend in May each year- The Bluenose Marathon in Halifax. This year was our sixth year attending, and fifth participating as a family. 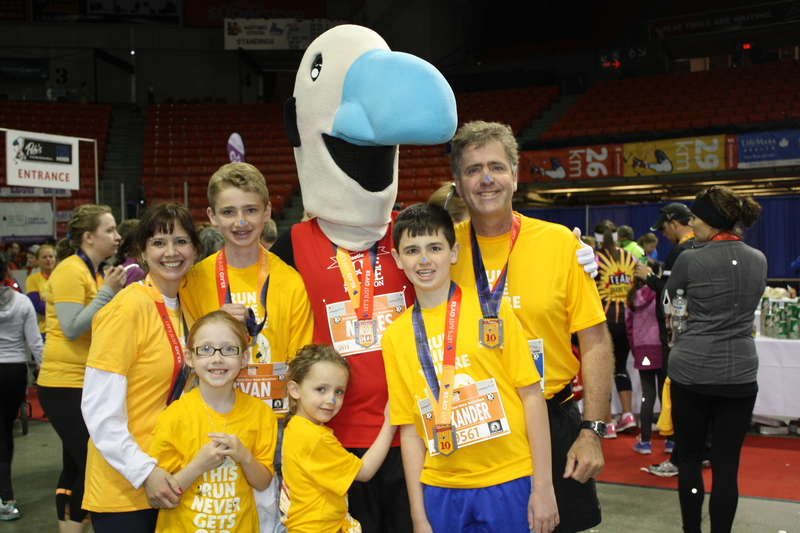 Six years ago, when he was eight, Evan joined the running club at his school and got to go on a bus from Truro to Halifax to participate in the Youth Run portion of the marathon. He was hooked and so were we. D’Arcy had been a runner when we were first married and the boys were babies, but like many of us do with exercise, put it to the side when life got busy with other commitments. So when Evan announced he wanted to start running, and then Alex wanted to join him, we did what crazy parents do and joined them. Once I got started, I realized it wasn’t so bad and once you get through the first kilometre or two, it actually starts to feel good. (As long as where you’re running is flat.) I still will make any excuse not to go, but it’s a healthy, free activity that we can do together as a family. This year, as I was registering us in February to take advantage of the early-bird registration rate (makes a BIG difference for a family of six) I registered D’Arcy first, and in doing so didn’t realize until after-the-fact that it automatically defaulted to the full marathon registration rather than the 10km race I was supposed to sign him up for! After I assured him that I had not recently taken out a new life insurance policy on him, he decided that he might as well train for the half-marathon. It’s been on his bucket list for awhile, and since he’s going to have a milestone birthday this year (ahem) he took it very seriously. We left for Halifax directly after school on Friday. 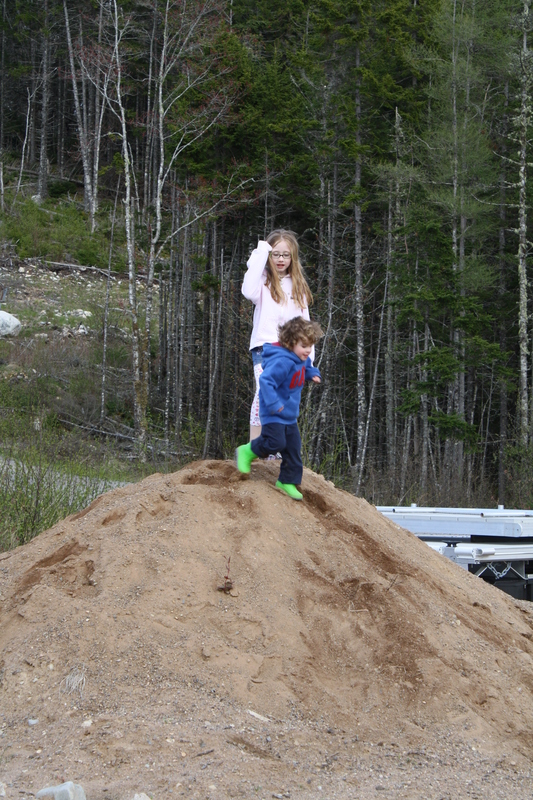 D’Arcy’s brother & his wife were away biking in Cape Breton this weekend so had offered us their house for the weekend. We can’t thank them enough! It was wonderful that we had comfortable sleeping arrangements and a full kitchen to use for meals, which are always tricky when traveling with food allergies. We picked up our race-kits at the Expo, got some groceries, then got settled in, making our plans and arrangements for the weekend. Saturday morning dawned bright and sunny, but cold. We entered into the mass of people at the Halifax Metro Centre to make sure the kids knew where to meet if they got separated. (We learned that lesson the hard way a few years ago!) We left the boys in charge of the girls at the start line, and D’Arcy & I went up the course to find a spot to cheer them on. 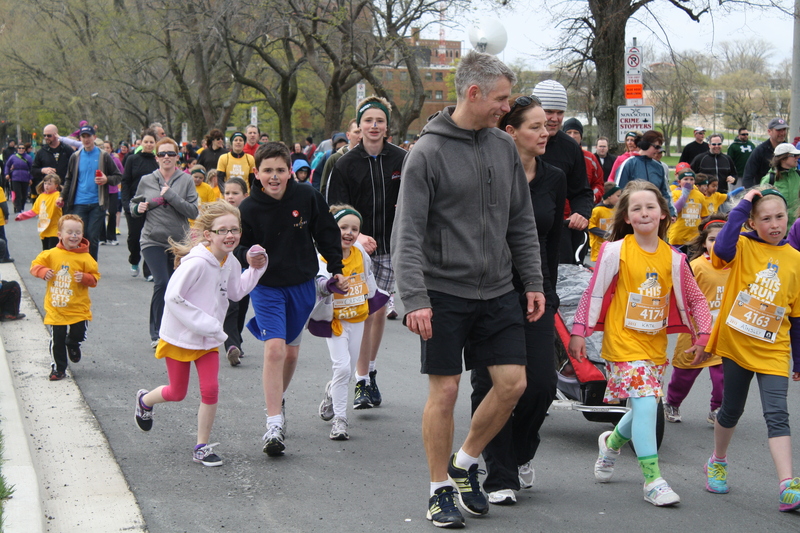 The Bluenose Youth Run is the largest youth run in Canada. 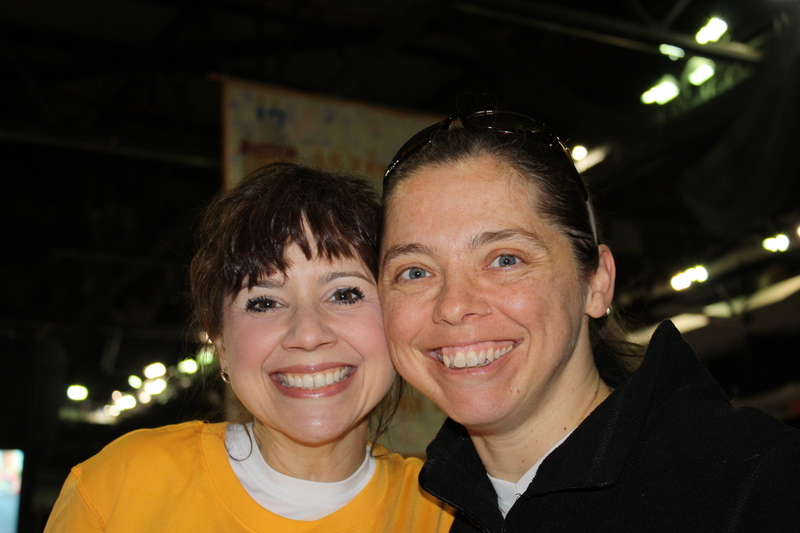 This year there were over 4,000 participants! It was extra special for the girls to run the race for the first time with their brothers – holding hands throughout the entire 4.2km course! 🙂 The energy and excitement is hard to imagine if you haven’t experienced it! I had worried that Sarah especially wouldn’t have a good time (did I mention it was bitterly cold?) and wouldn’t want to participate again, but even she had a huge smile each time we saw her! I think Alex was the motivator for the group! 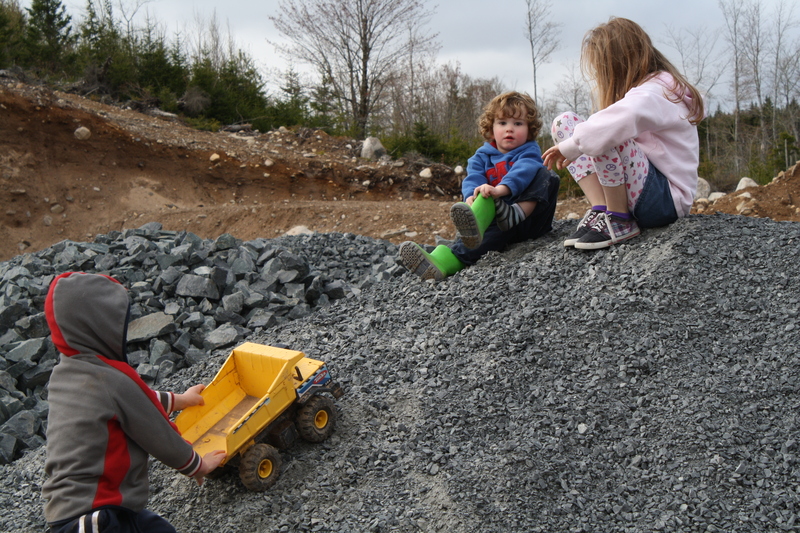 Nearing the finish – love that Sarah’s sweater is now open to show her bib and Evan is wearing Olivia’s sweater around his waist! The McRunners, together to the finish! After the race, we got ourselves together, packed up some food and went out to Mike & Emily’s to help with their boys and make them some supper. (For those who are new here, our niece Emily just had major surgery to remove tumors from her spine and neck.) It turned out that Emily wasn’t having a very good day, and was in the city having a procedure, so it turned out to be good timing that we were able to be there that particular day. 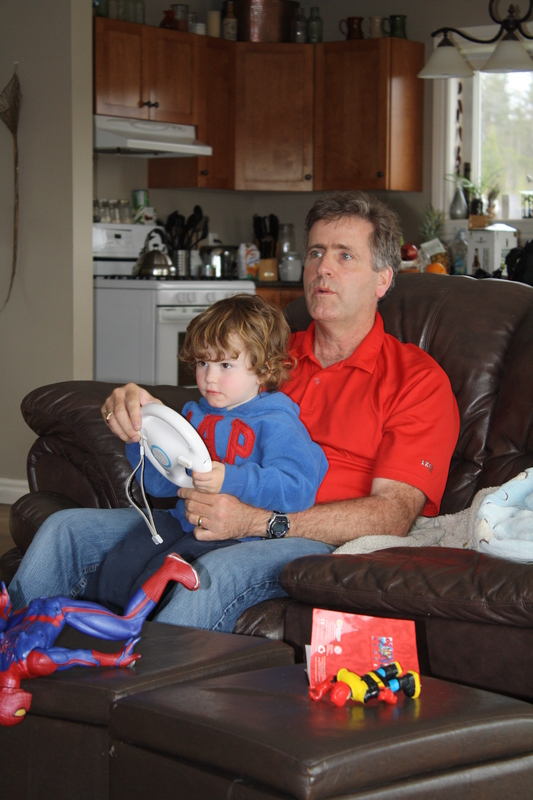 We spent the afternoon with Mike and the boys: playing racing games, walking in the woods, and getting some laundry caught up. Uncle Darce and Seamus were a team! Phinn gets ready to take us to “The Pit”. A fun way to spend the afternoon. 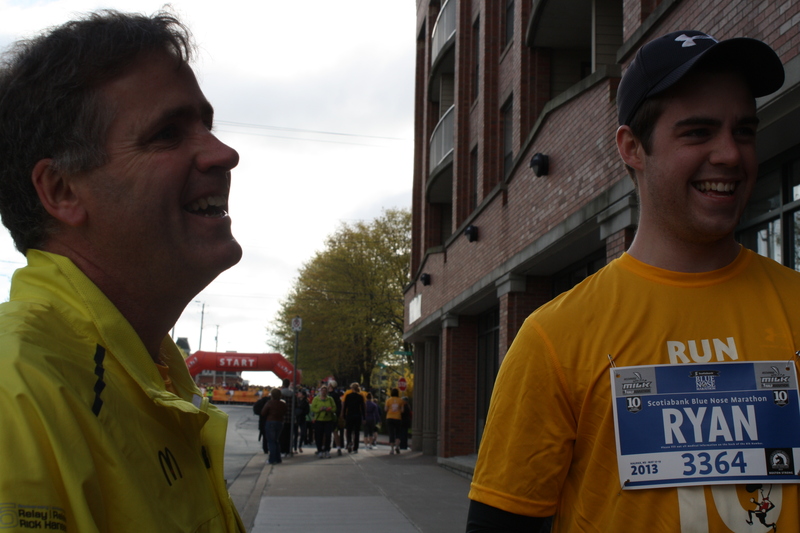 Mike & D’Arcy discuss marathons, boats, and renewable energy. Olivia gets a lift from cousin Mike. 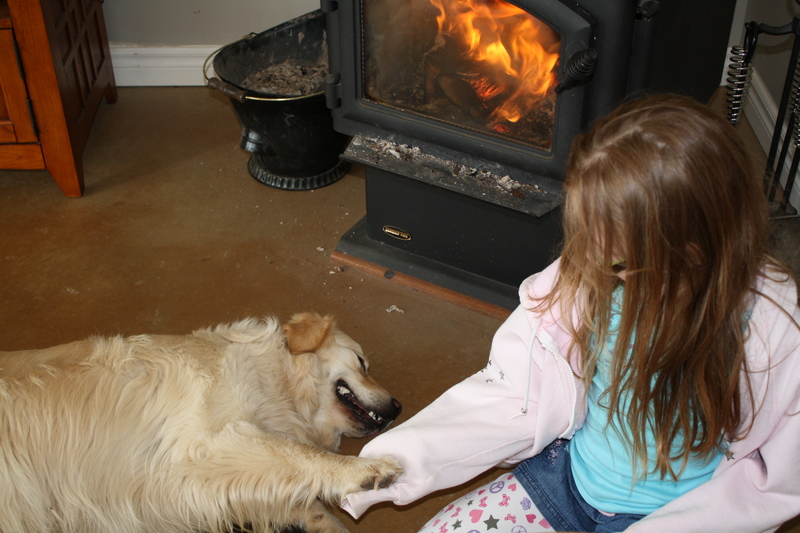 Warming up together by the fire when we got back to the house. Sarah makes a new friend. We were up bright & early on Sunday morning to get ready for our big day! I don’t think D’Arcy or I slept particularly well, but as my running partner, Kim, told me – “as long as you rested your legs, you’ll be fine”! 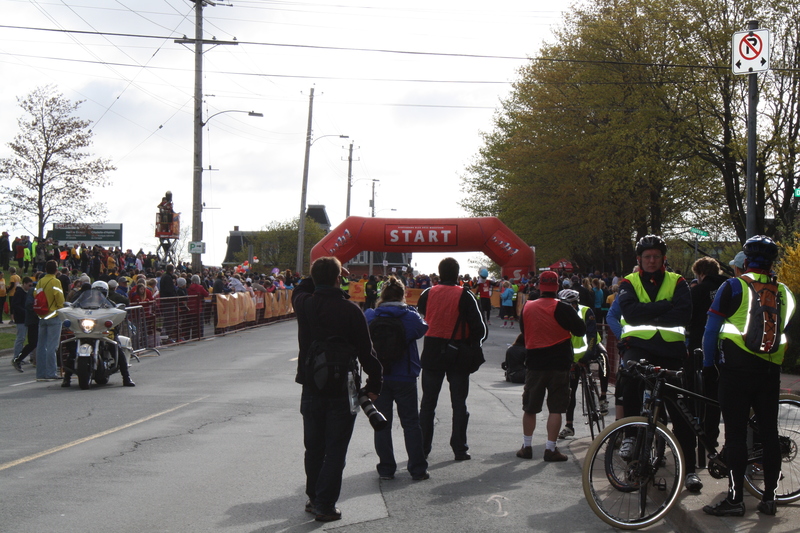 Evan & Alex were running the 5k which left right after the marathon runners, so we went up to the start line to watch. We met up with D’Arcy’s sister Erin, and nephew Ryan, who were also both running the half-marathon. We watched the boys start, then said good-bye to the half-marathon runners and went to the Metro Centre where the girls were going to wait to meet the boys. Because it was so cold, the girls were happy to watch the finish on the big screen inside. Evan & Alex ran a good race, although Evan’s shoelace came untied and he ran the rest of the race with it like that rather than stopping to tie it. They had mixed reviews on their times. They both wanted to come in under 25 minutes, but Evan’s chip time was 0:25:29.5 and Alex’s was 0:26:33.1. 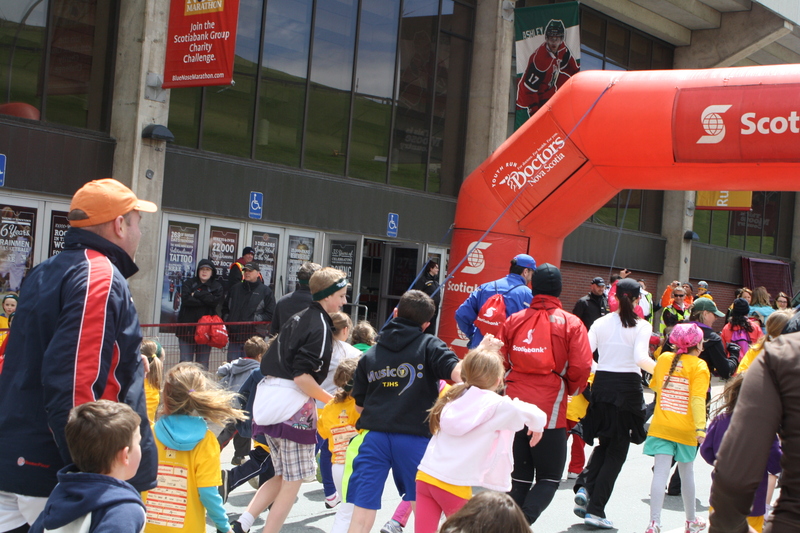 Personally, I’d be happy to be able to run 5km at a 5 minute pace… When they finished, they came in to the Metro Centre to look after the girls while D’Arcy & I ran. Their race had started at 8:10, D’Arcy’s at 8:45, and mine at 9:00. It gave us lots of time to switch off. 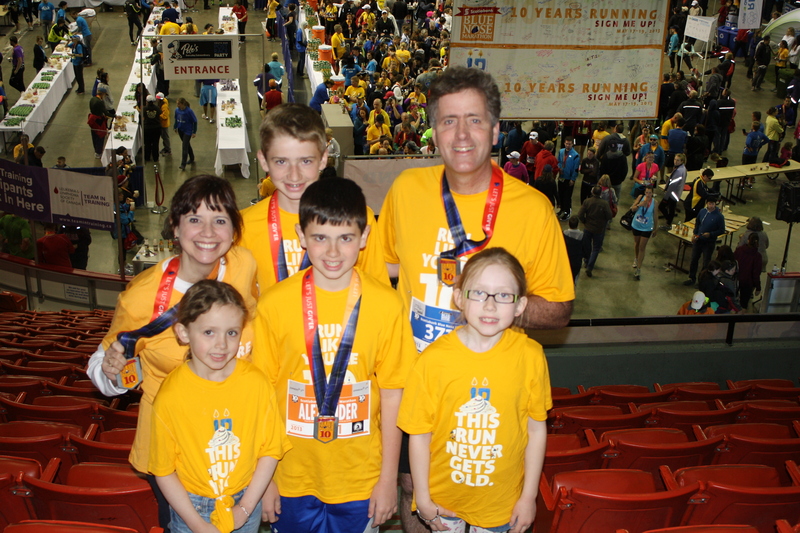 We met up with the kids who had been great while we were gone and started watching for D’Arcy to cross the finish. He and Erin completed their race with a time of 2:02:55. D’Arcy had hoped to finish in two hours. Our nephew Ryan? His time was 1:40:42. Show-off. Kim & Anne, ready to run 10km together. 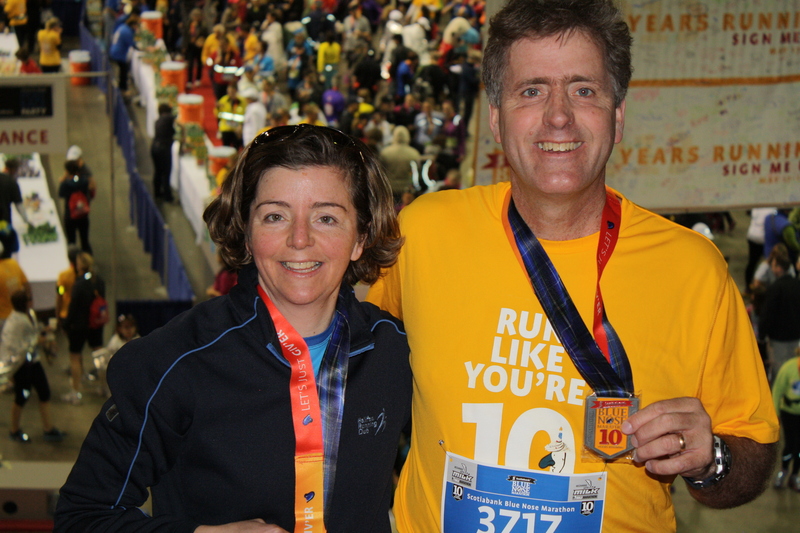 D’Arcy and his sister Erin with their half-marathon finisher medals. Thank you Erin for all your support and for coaching D’Arcy through it! The McRunners, happy to be finished! Our yearly photo with Myles – another part of the tradition! We had to take one more to make sure Aunt Erin was in the photo too! After the race, we took the girls to Woozles Bookstore – a favourite – which Sarah reported was the best part of the weekend. 🙂 We went back to Brian & Morag’s to do the laundry, change the beds, and pack up. 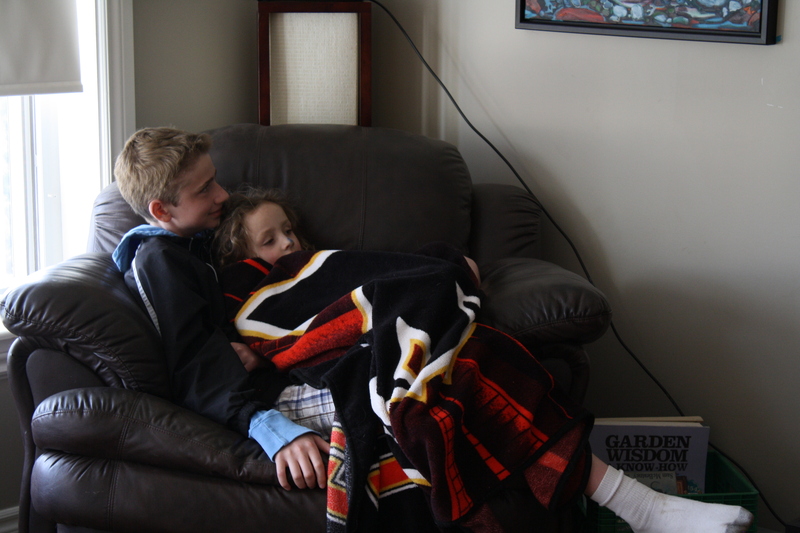 A friend of ours had died, and the memorial service was being webcast, so we took the time to watch. Although we couldn’t get back to town in time to attend in person, it was wonderful to be able to be part of it from away. Olivia wasn’t feeling well and had developed a fever, so we stayed away from the new baby we wanted to go see and from any other people we wanted to visit. We got home in time to have some Chinese food for supper (since Olivia wasn’t eating anyway), then hung out quietly together until we all went to bed early. Our tourist season starts in earnest today, and we have rooms booked every night this week. 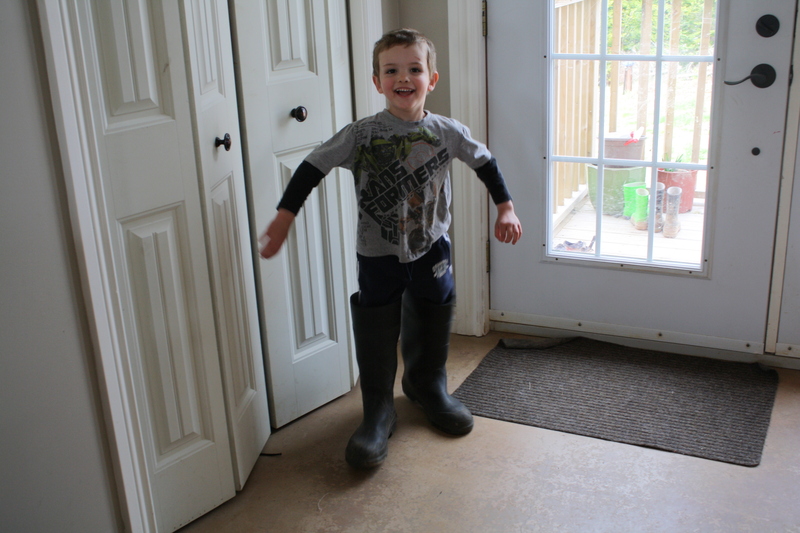 D’Arcy was up early to mow the lawn before the rain starts, and Alex has a full day of dress-rehearsal before his school’s production of “Annie” this coming weekend. Our lives tend to be busy, so I am happy that six years ago Evan suggested we start running and I reluctantly agreed to join him. 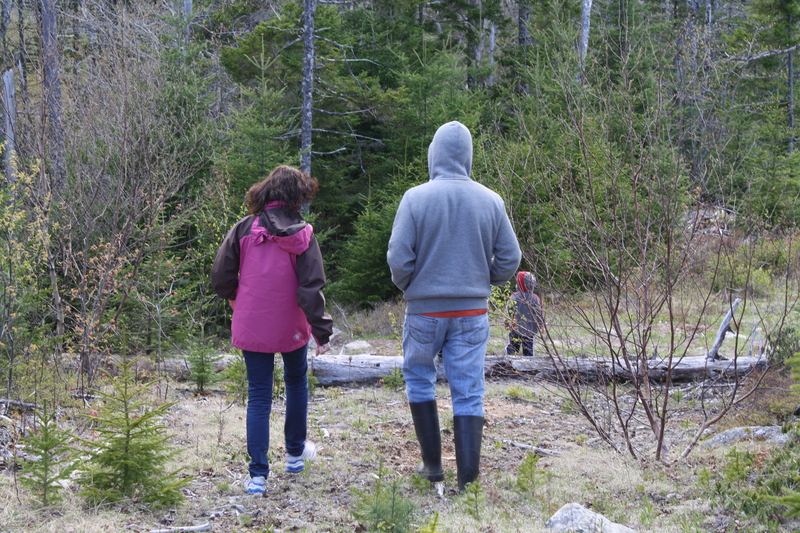 Even though I can no longer keep up with my teenagers, it’s still an activity we can all do together as a family, and the short respite for us during the May long weekend keeps us refreshed for the season ahead! Because of these affiliations, I’m often lucky enough to be invited to differet industry events. My favourite event of the year (and there are some wonderful events) is the NSTHRC Recognition of Excellence CertificationDinner each May. 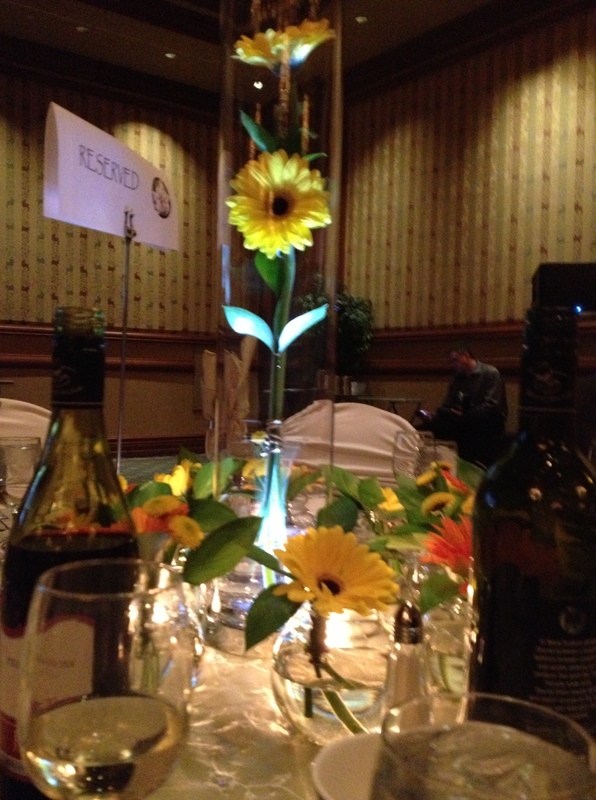 This year, the 18th annual, was held on Wednesday night at Casino Nova Scotia in Halifax. I love it because members of the industry get together to celebrate those front-line staff and properties who have received national certification creditentials during the past year. Last year, I received professional certification as a Tourism Trainer. Nova Scotia is unique in that as a province, we have the highest number of certified tourism professionals in Canada! In fact, our tourism department is committed to ensuring that 100% of our Provincial Visitor Information Centre employees are certified. This year, I had the distint pleasure of cheering for three of my former NSCC Tourism Management students, Theresa, Heather and Jeff, as they received their national certifications as a Heritage Interpreter. I’m so proud of all three of them and so happy I could be there to share in their special moment! 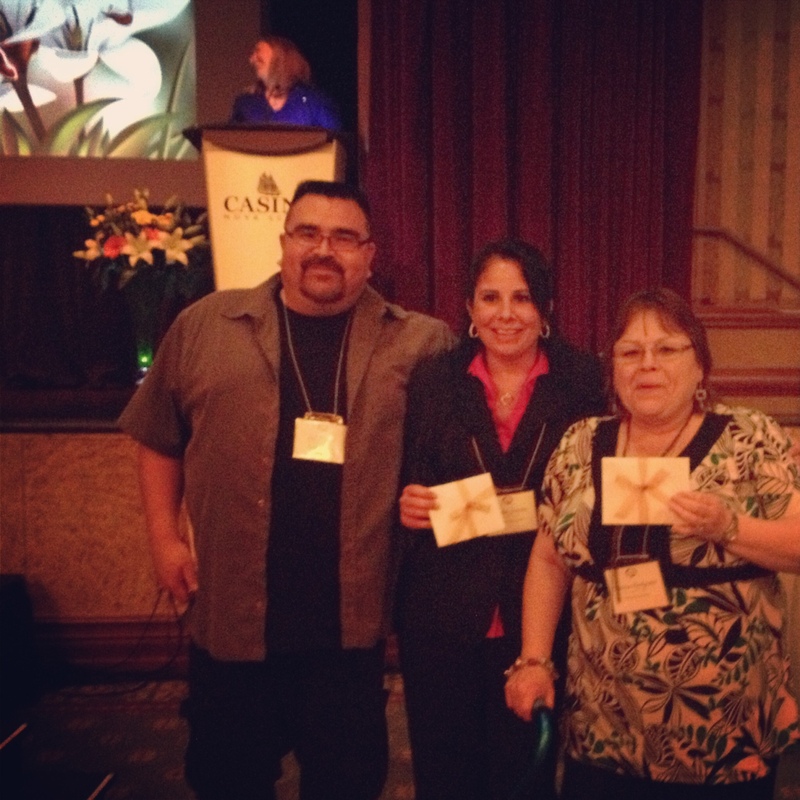 Congratulations to all three of you! 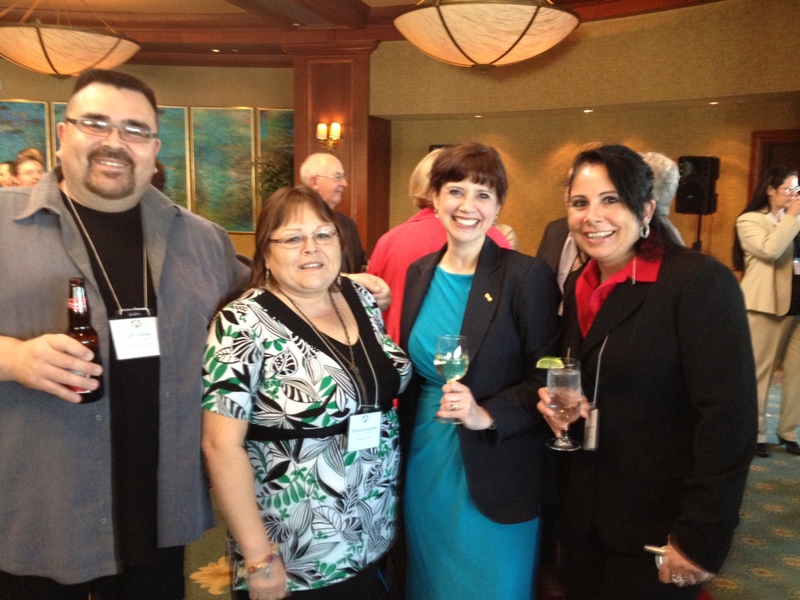 Jeff, Theresa, Anne & Heather – an NSCC Tourism Management reunion!